This image won a trip for two to Broome in a West Australian Newspaper travel photo competition. 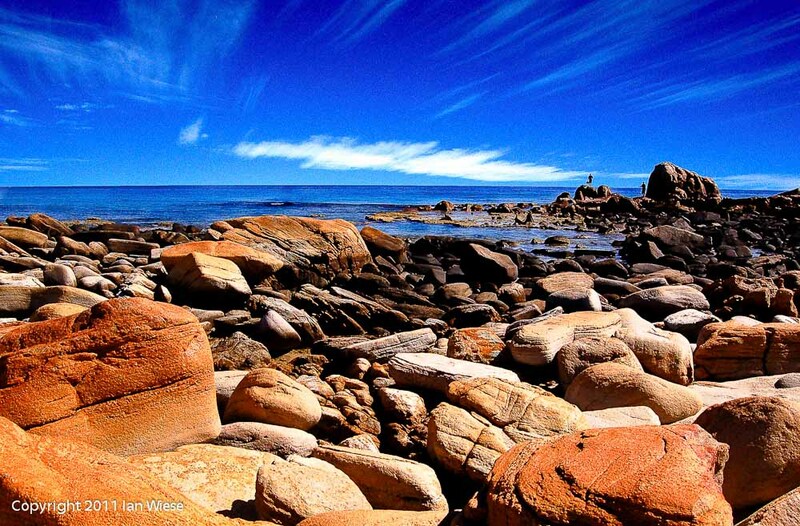 It was taken at Pt Picquet, near Dunsborough. The red on the rocks is a lichen. Picquet was a lieutenant on one of explorer Baudin’s ships. At the time Baudin visited here (around 1800), Picquet was regarded by Baudin as “a likeable fellow”. By the time the journey ended Picquet was in disgrace, probably more by irration caused by people being in confined spaces on the ship for long periods. Picquet drew his sword on Baudin, and faced courtmartial, but was saved by the fact that Baudin died before he reached France and the other officers wouldn’t testify against Picquet. This is the best fishing spot for herring between Dunsborough and Cape Naturaliste. The “header” image is taken at the same spot, but at the end of summer when the sand has built up. This entry was posted on March 1, 2011 by ianwiese. It was filed under Pt Picquet and was tagged with Pt Picquet.